We are excited to be debuting our very first Wood Festival as part of this event, and will be creating a large marquee and outside space of coppice and wood craft working demonstrations. Our cooper, Wocko, will be showing how traditional wood-crafting is used. No nails, screws or glue: it’s all completely traditional and wonderful to watch and learn about. 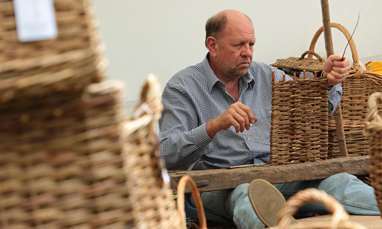 Traditional English willow basket maker Malcom Ruffell will be demonstrating this old English craft. Come and see how it’s done. Master craftsmen creating stunning pieces of art using only a variety of chainsaws and an old log! Watch them produce stunning showpiece carvings for the Sandringham Cup over the course of the weekend, as well as enjoying the fast action speed carves twice a day. A bodger is a skilled craftsman, who traditionally made chair legs and braces. The legs were turned on an early pole and string treadle powered lathe, the string is wound around the work piece which rotates backwards and forwards, allowing the bodger to cut or turn in one direction only. Their equipment was easy to set up and move around as they travelled from place to place. Nowadays, bodgers produce a wide range of items. A traditional craftsman who works green wood outdoors, using traditional country methods. The Wobbly Bodger particuarly loves making fan carved birds, handmade from a single piece of carefully selected larch, split approximately 40 times and manipulated to open out each individual feather. Nene Coppicing & Crafts is a voluntary community group dedicated to promoting heritage woodland management skills, conservation and traditional crafts. Learn traditional skills associated with our ancient woodlands. be done using steam and vintage machinery from down the years. We will also have an extensive collection of vintage tools on display. Timber hewing is the process of shaping a tree in to a square or rectangular beam. It is a labour intensive process and is done using different sorts of axes. This method of shaping trees has been carried out across Europe from the Middle Ages to the current day and is still the primary method of shaping wood in some Eastern European countries. They are favoured by some gardeners for specific jobs, sweeping leafs of patios, moss from timber decking or as the broom head wears down and becomes more stiff it can be used for clearing moss or worm casts from lawns or dog hair from rugs. Adam King will be demonstrating how the traditional besom broom is made from scratch.